Gemstones have always been a source of attraction. Earth herself has created such exotic gemstone creations that man can never thank her in the way she deserves. Gemstones are minerals developed in such a way that they look extremely beautiful and exotic. Ruby and emerald are two of these precious gemstones. One thing that should be made clear is that they are precious not because of their worth in the market but because of their scarcity. Ruby is a red colored gemstone that is rated 9 in terms of hardness on a scale of 10. Natural rubies are not perfect most of the time, with color impurities and needles known as silk in them naturally. The ruby that one gets from a store is somewhat processed in one form or the other. The color range of rubies range from orange to purplish red. Emerald is a green colored stone that is found more or less the same form as found in many stores. The main process that takes place with emerald is its proper shaping and polishing. Emerald is a soft stone in contrast with ruby. It is rated 7.5-8 in terms of hardness on a scale of 10. Like all the other gemstones, the 4 Cs validations are done before the price tag is attached to the respective stones. They are being evaluated on the basis of their color, cut, clarity and crystal. Color is the most important principle in the price tagging of a stone and stones with clarity like water are termed to be the best stones on the planet. Rubies value is determined by their color. The brightest red is the most precious one and is usually termed as pigeon blood red ruby. The rubies with a red hue in the middle and color ranges from orange to purple on the outside are considered to be comparatively less expensive yet quality gemstones. Emeralds on the other hand are green and clear in color. Here, only the four C validation is used instead of other factors as well. The stone being green in color is next checked for its clarity and it is such a fine stone that naked eye can even evaluate the quality of this stone. 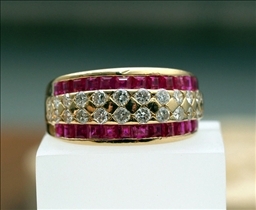 The ruby gemstone is readily used in women's jewelry for most of its colors are well suited to the ladies. However, a few of rubies have been used in male ornaments. These are usually in the masculine hues and 0tones. Emerald on the contrary has a color favorable to both the genders and looks extremely good in any of the precious substances that are used for making ornaments. Emerald looks extremely good in pendants and other accessories that are usually worn by people from both genders. 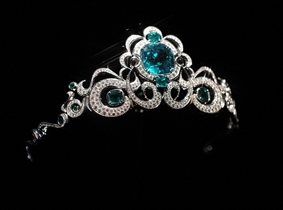 Emeralds can be used for both men and women's jewelry. Validating emeralds is easy, as one need only to look at to understand its value based on the to see the beauty of the stone. Which mineral is more beautiful in sunlight? I prefer Pokemon Ruby for the Gameboy Advance because of the pokemon you can capture and you don't need to do as many quests as in Emerald,The downside for me is that you cannot catch the legendary pokemon from Pokemon Shappire in Ruby where in Emerald you can catch alot more legendary pokemon.